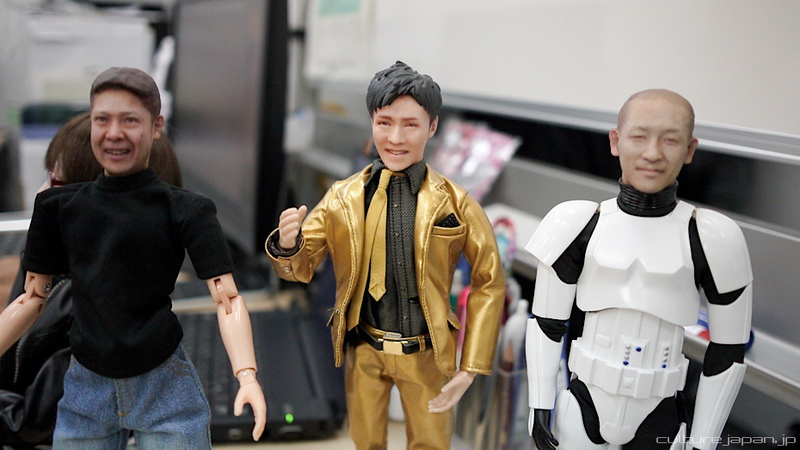 Based in Tokyo geek mecca Akihabara, Clone Factory is just that: a factory that makes clones. These clones are made from flesh and blood, but resin. They are your own personal clones, ready to rule your bookshelf. Blogger Danny Choo from the appropriately named DannyChoo.com checked out Clone Factory, getting his mug measured, digitally rendered and then printed out on a 3D printer. The mini-Choo head was then cleaned and covered in a protective coating. Later, the head was stuck on a Stromtropper figurine. There's a walk through in Choo's site (link below). According to Clone Factory's site, there's a push to use these mini-dolls in weddings. If I had one, I'd use it to kick the crap outta other figures. "These clones are made from flesh and blood, but resin"
Missed a NOT there somewhere. I can't decide if this is cool, or creepy as. Too strange for my lifetime. Man... i'd make a bunch of 'em then use them to troll people. Hide them in glove boxes and stuff.